We welcome you to our charming and sunny Sierra cabin nestled in the pines. 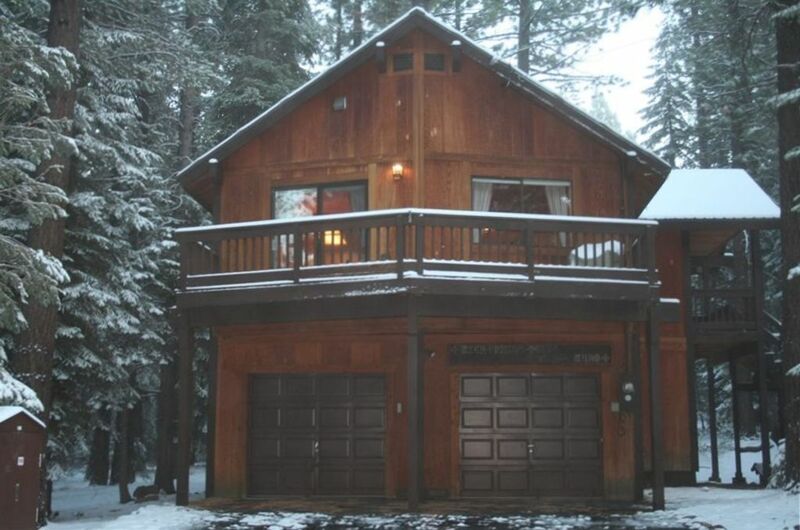 The cabin is located in a peaceful setting in the heart of Tahoe Donner and backs to Tahoe National Forest. It is only minutes away from downtown Truckee, ski resorts, lakes, casinos, restaurants and shopping. Our 3 bedroom, 2 bath home sleeps up to 7 comfortably and is child proof, completely furnished and has a 2-car garage. It is ready for a weekend or week long retreat in the mountains. The cabin has an airlock entry and includes beautiful hardwood floors and ceilings, open kitchen and living room plan, breakfast bar, rock fireplace, and south-facing deck. The master bedroom is located upstairs with a queen bed and walk-in closet. The downstairs bedrooms include a twin bunk in one, with a TV/DVD/VCR-great for the kids. The other bedroom has a full/twin bunk and an adjoining bathroom. All bedrooms have beautiful forest views. Cabin Amenities: Includes fully furnished kitchen with brand new stainless steel appliances (dishwasher, gas stove, microwave, refrigerator w/ ice maker) toaster, coffee maker, blender, cooking utensils, dishes, etc. Cable TV, Wireless and High Speed Internet, Video/DVD Player (upstairs and downstairs), central vacuum, central heat, firewood. Tai and I live in the beautiful coastal town of Santa Cruz with our 2 daughters and gentle giant of a dog, Kona. Before our move here, Tai lived in the Sierra Foothills and I lived in San Francisco. Our paths crossed in the Sierra moutains where we married in 2000 in a ceremony at a small cross country ski resort he had been managing, called Eagle Mountain. Although we live in a lovely beach community, a big part of our hearts is connected to the mountains of the Sierra. We were fortunate to buy a cabin in Tahoe Donner and have enjoyed many years of family vacations in both summers and winters up here. It has been a blessing raising our two daughters and sharing the beauty of both the coast and the mountains with them. We enjoy renting out our cabin so that we may give others the opportunity to savor the beauty and tranquility of our home away from home and the lovely natural surroundings of Truckee. Not only were we married here, but Tai managed a cross country ski resort and white water rafting company in this area. We lived in the Sierra Foothills for awhile, but spent lots of time in the Truckee/Tahoe region. It was only natural for us to want to buy a place in this area as it has a lot of lovely memories and of course, we continue making many new ones. After looking in the Serene Lakes area, we knew that Tahoe Donner was the place we really wanted to be and grow. It has been amazing watching all the wonderful changes and improvements take place with this community. This home was perfect! It was not too big and not too small. We had only a one year old at the time, but knew our family would grow and that this cabin would have all that we needed. We also love the space around us. We have an empty lot on one side and a small A-Frame home on the other that was one of the first original built in TD. The nice south facing deck brings warmth and bright light into the upstairs, where there is plenty of space for everyone to gather for a BBQ on the deck, a board game around a crackling fire, or just some quiet reading time as a Sierrra blizzard blows through or the warm summer breeze whistles softly through the pines. This little cabin has it all and you will feel refeshed and relaxed after a weekend or a week retreat any time of year. There is a land line phone which allows local and long (within US) distance phone calls. For a faster checkout, you may want to bring your own sheets, pillow cases, etc. But if needed, pillows, blankets comforters and linens are provided. An indoor fireplace is located in the living room. Driveway and garage only. No parking allowed on the streets. Wi-Fi available. Verizon works best, AT&T is spotty. For a faster checkout, you may want to bring your own towels. But if needed, towels are provided. Refrigerator, Gas Range, Dishwasher, Microwave, Coffee maker, Blender, etc. The table alone fits 6 ppl. A leaf for the table and one booster chair for little children is provided. We have SONOS which allows for Pandora and Rhapsody. You must download app to use. Very easy. Large balcony faces south with view of Hansel Ave. Patio table and chairs with umbrella provided in the warmer months. We have a large sunny south facing deck as well as a smaller deck with stairs to front door which is covered and has gas grill. Pools located at the Trout Creek Rec Center and Northwoods Clubhouse. Lap pool available year round. Must use Transferable Guest Cards for access. 4 ppl per card and $8 fee per person. Great property for Teo couples with three young kids. Everyone enjoyed themselves in the snow! Lovely and very comfortable cabin. Really felt like a home and had everything we needed. Very close to activities too! Thank you! We stayed for a 4-night retreat and chose this property because of the combination of it's location (backs to open space for us to hike, ski, play) and the great reviews. The location was in fact excellent. The whole family was able to play right out back in the forest and we didn't see another person several days in a row. There's a shallow slope, just enough to play around a bit with skis or sleds, and not enough to be concerning for small children. The house itself has been thoughtfully appointed, is functional, and cozy. There was plenty of space, and we were able to bring our dog along for her first time in the snow - she loved it (and the house, too). We did run into an issue when we arrived - the unit had not been cleaned. While that's never a fun situation, the owners were extremely responsive and addressed the situation immediately and with professionalism and generosity. Based on our experience I wouldn't hesitate to stay here again. My family thoroughly enjoyed our stay at Tai and Maria's lovely Wolakota Cabin! The location was perfect - close to all the amenities Tahoe Donner has to offer (Trout Creek Rec Center, The Lodge, The Northwoods Clubhouse, ...etc.) and with the most gorgeous open space directly BEHIND the cabin! The cabin was clean, cozy and very welcoming. We have rented other homes in the area for the last four Christmas holidays - and have been disappointed. Wolakota was a wonderful surprise! It was well stocked and equipped with everything we could have asked for. It felt like a second home, not a rental. We are looking forward to our return visit this summer. Thank you again, Tai and Maria!!! Our second visit and looking forward to coming back in Winter. Our cabin is located only minutes from Z Marketplace, The Lodge Restaurant, TD golf course, TD equestrian center, TD x-country ski resort, TD downhill ski, TD private marina, Northwoods Clubhouse and Trout Creek Recreation Center which includes a gym, swimming pool, hot tubs, sauna, steam room and massage.